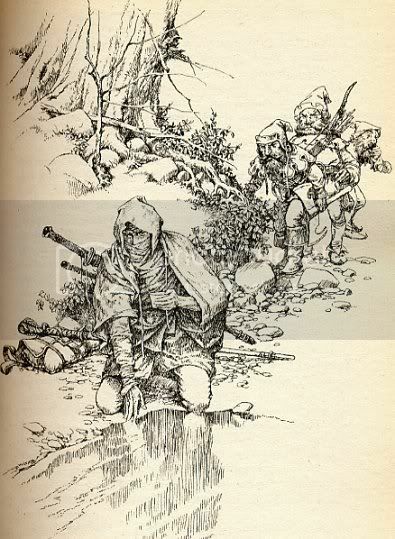 I promised I would do a post on the artist Darrell K Sweet, who did the artwork and cover for The Elfstones of Shannara and theWishsong of Shannara. I love books that allow for artwork in them.. I know it's an added expense, but it adds so much to books. I have a good imagination... but a little help goes a long long way! 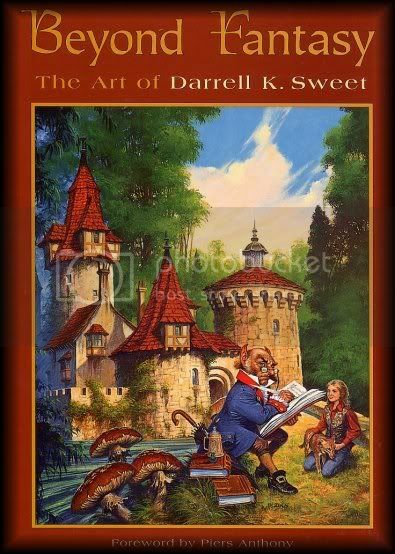 I have always liked Darrell K Sweet... so much so that back in 1996 I obtained a book of his art work.. I wanted to show you some of the work in this book but it explicitly says "no form of reproduction including electronic".. so in order to honor this I will give you his website where you can see all the pictures in this book.. "here"
I hope you take the time to check him out.. he's really good! (duh ) He's painted many book covers and some you may recognize at this site. 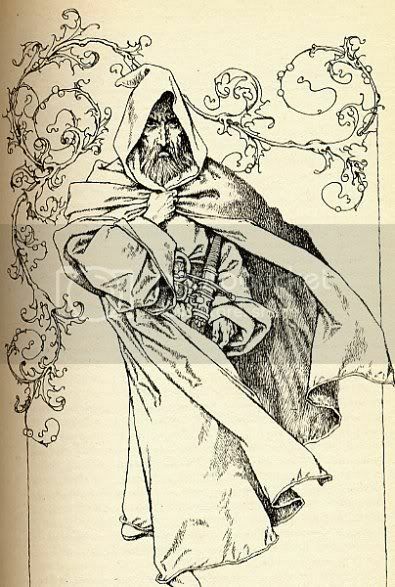 (I took note that he did a number of covers for Piers Anthony) The art book above seems to no longer be available for purchase except in a "used" form, some of those can be found on Amazon. 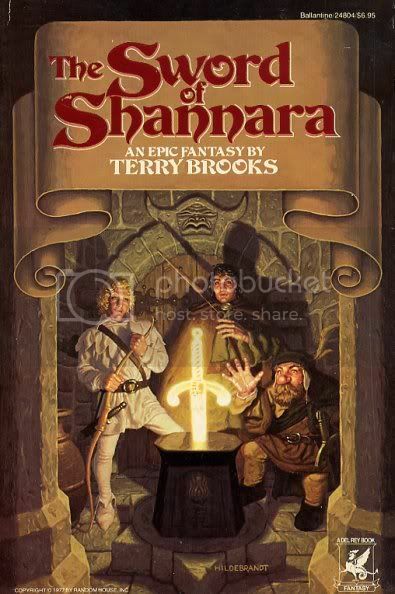 As for the Shannara books they are available in mass paperback (links are above) or you can get the entire trilogy (Sword of Shannara) in a hardback form for the same price as the three paperbacks in Amazon. 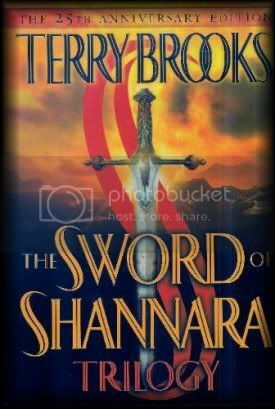 Book : 2 The Sword of Shannara by Terry Brooks. Right off the bat I have to tell you all that I have the old TPB versions which you probably can only get on ebay anymore, so the pictures you see for the cover and inside are only available in the old TPB version. Inside this book, besides a great story is a fold out painting by the Hildebrandt Brothers and some sketches... here are a few before I get into the review.. 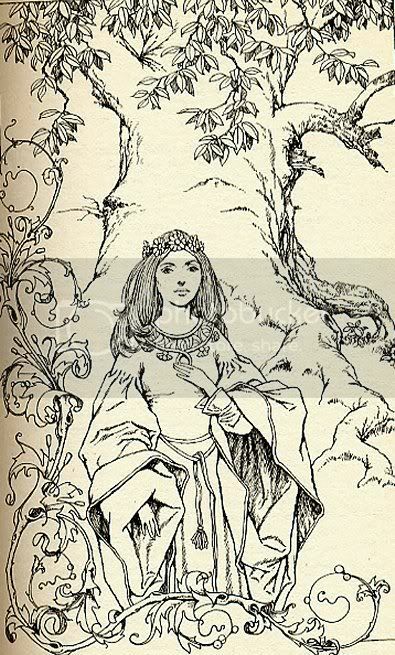 Rarely, if ever do you see drawings such as these in an adult Fantasy book. I don't know if they made them smaller and included them in the mass paperbacks or not... 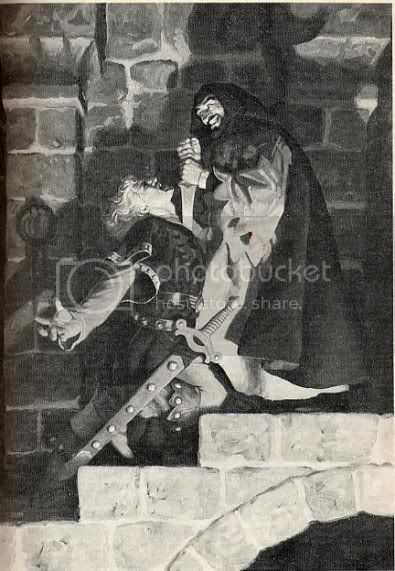 I do know they didn't use Hildebrandt's cover. 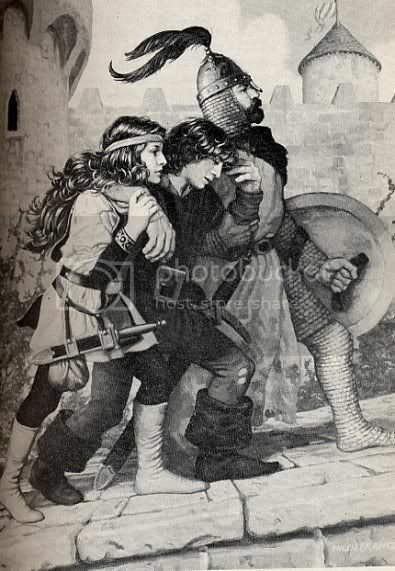 Back when this book first came out it was slammed really hard as a rip-off of Lord of the Rings. And to be honest, as I looked around at other reviews.. it still is! 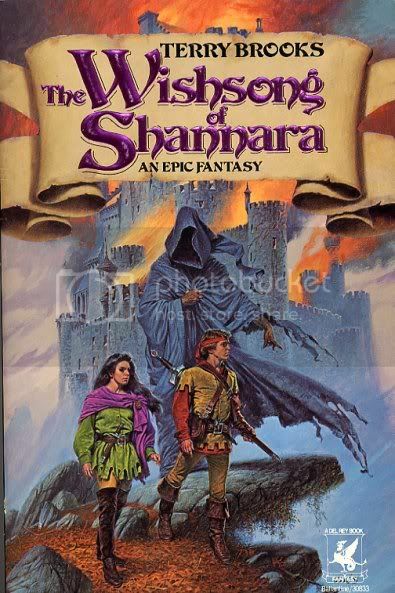 But bear in mind... many books have come from this original that all tie in to The Sword of Shannara and have continued success for Terry Brooks. This can mean only one thing.. eventually, his characters make their own imprint. As much as I've enjoyed book one of this very long series, (however you can read just the trilogy and even just book one !) and as much as this is the first reread of it I have done in more than a long time, and as much as it drove me crazy searching for the original tpb to buy once again (loaned them out and somehow they never came home again) I will say that there is no denying that if you get this book to read you will not only make comparisons to LOTR but you will probably announce them to yourself out loud! I know I did! haha.. 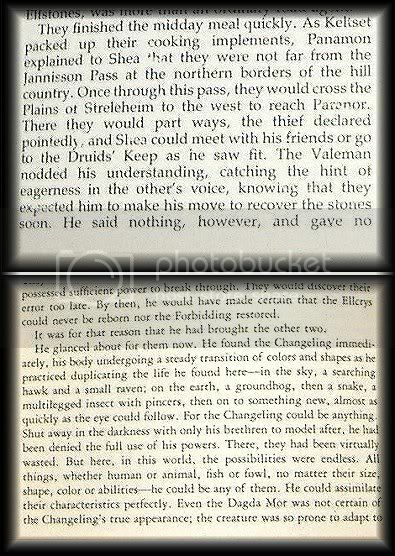 I think it was considered a "bad rip-off" for years because no one could think that anyone could be as good a writer as Tolkien. 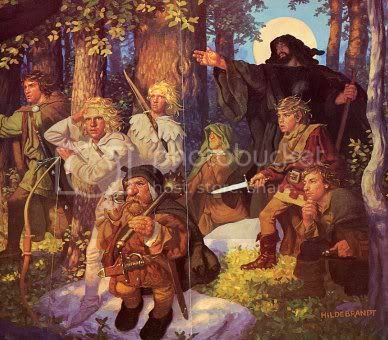 But years ago when I first read the book I knew I wanted "more Tolkien, more LOTR" and I knew I wasn't going to get either... what I got was Terry Brooks. So.. a bad rip-off? I don't know about the bad part. Good characters? Yes, definitely.. but this is the part some might have a hard time with the comparison to Tolkien with. With all the reviews I read, I will say that this book isn't for everyone, and it probably has more bad reviews than good....and they all center around the fact that people couldn't get around comparing it. It does seem obvious. But I guess way back when I first read this book I wanted to see what he did with his characters anyway. 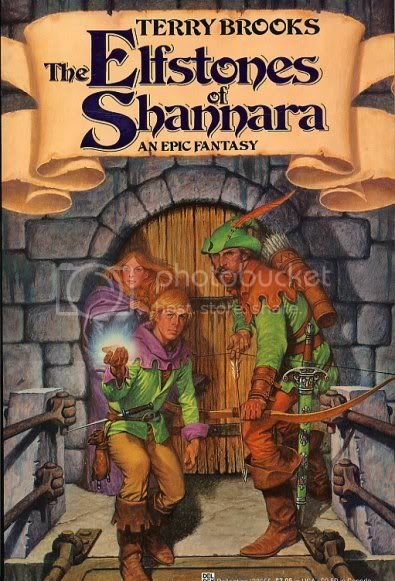 And considering that other books that began with The Sword of Shannara are still being release today.. I'd say there was something worthwhile in it all. It's been years since I read these books, and I didn't have so many problems with my eyes back then, add to that I guess I never realized that the next two books to this trilogy drastically change. For one thing the artist changed (another good artist so that isn't the deal breaker). The Artist for the next two books is Darrell K Sweet. An excellent artist, and I even own one of his art books! But the main change in the next two books is: THE FONT SIZE! 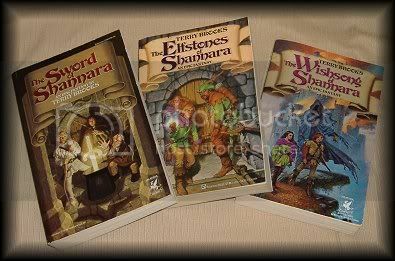 Elfstones is 469 pgs and Wishsong has 498 pgs, I had planned on reading the original Trilogy but after trying to read the first chapter of book 2 I decided against it. Of course, it's not like I don't have other books in my TBR pile to read!!! I just wanted to revisit old friends. But I still have other books to reread! I am determined this to be a ReRead my Favorites year. 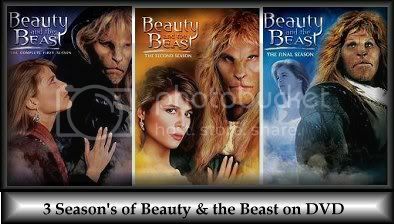 This is just a little update about the dvd's of Beauty and the Beast.. and if I seem obsessed, so be it. I tend to get this way sometimes *sigh. I've watched the whole first season and today watched the 5th episode of Season two.. George R R Martin's name is all over this television series! I hope (and assume) he made out very well! If he didn't write the episode he was a consultant or a producer! Sheesh! 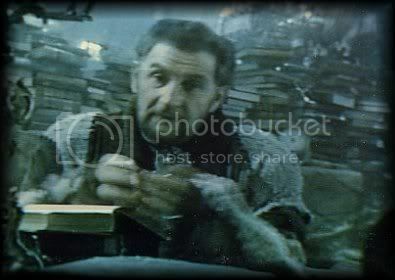 One thing I had forgotten.. or maybe not, but just pushed to the back of my memory cells, is that nearly every scene that is "below" where Vincent and Father live , is filled with piles and piles of books! LOL.. gotta love it! After a while it really does begin to look like home! HAHA! I can no longer watch this series without smiling at every pile of books I see in the episodes! My mind goes nuts! "Oh Carl would love this!.. So would Chris, and Cath, and Steph and..and.. on and on !" I was wondering if I should try to take a photo when watching the next episode when I remembered my small binder I have on Roy.. Sure enough! I found a picture I had taken off the television when the series was originally on the air!! And low and behold check out the background! BOOKS! Piles and Piles of books!! They were actually much longer than I expected! So I enjoyed hearing Roy reading... and for you Fans of A Song of Ice and Fire, I would say click the link and have a listen! Below is a snap of the article honoring De for a Golden Boot Award. 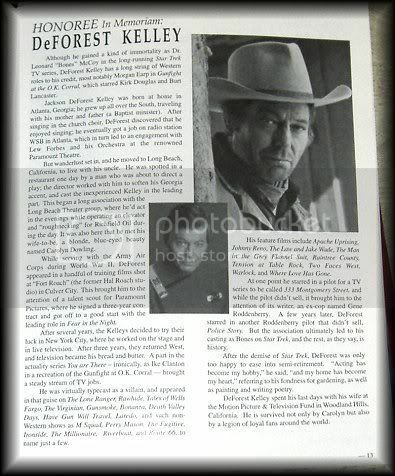 I remember De had a plaque hanging in the hall of his house,it had a pair of golden spurs on it.. given to him from his cowboy movies. 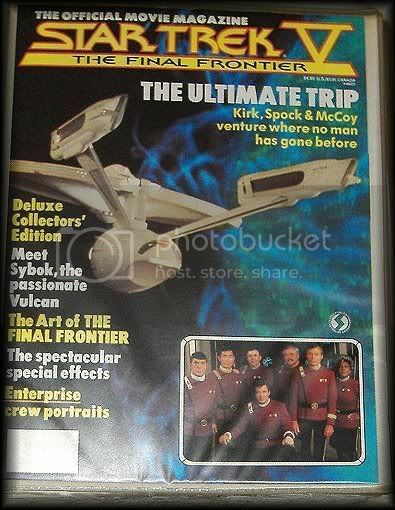 (I think that was a Golden Spur Award, but I can't remember now) That would be surprising to some who don't know of De's Cowboy years before Star Trek came along. 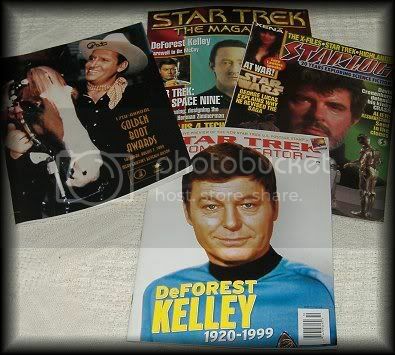 I opened some of my binders with my collection on DeForest and I knew I had old magazines in them, so I just snapped the first few I came to . .. and didn't think to write down the dates of them ..ah well.. 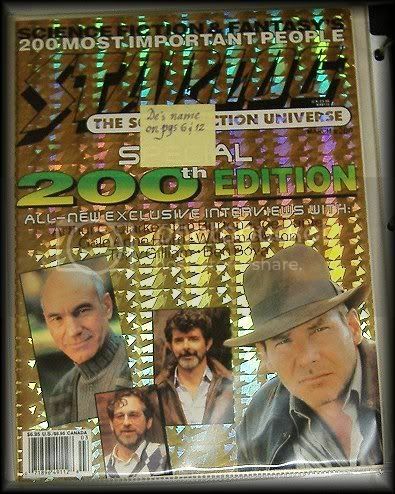 There were many times and so many magazines out whenever Star Trek did something that I didn'tsave all the magazines in tact, some I just cut out the article and put that in the binder. 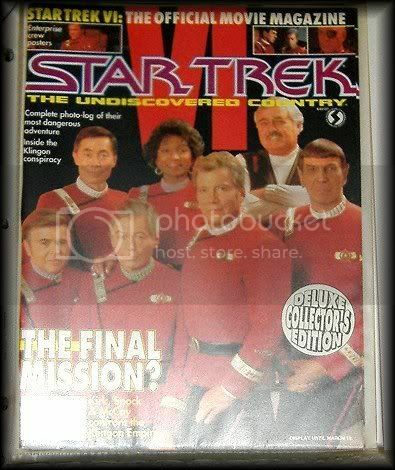 But I do have a number old complete magazines in the collection! 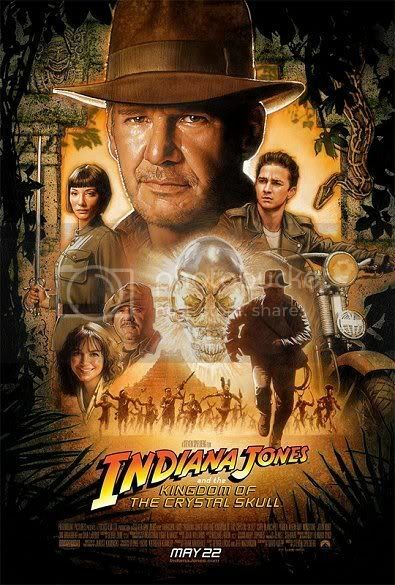 Which leads me right into................ Indiana Jones and the Kingdom of the Crystal Skull.... which... I just came home from seeing at the movies!!! Yiiiiiihaaaaaaaaw! I suppose you expect me to give a review of the movie.... nope. Not gunna do it. Not going to spoil anything for anyone... I will say one thing only (and I do admit I am VERY prejudice!)... Harrison Ford cannot disappoint! Thank you Harrison for being Indy one more time! No promises... but here I go again!.. Ok, so this is a rather smallish YA book, double spaced for easy reading.. and I have to tell you, be it my love of dragons or what I don't know, but this little story grabbed me and made me read it within 2 days ! Yep it was one of those, this is a: to cute to stay away from, book! 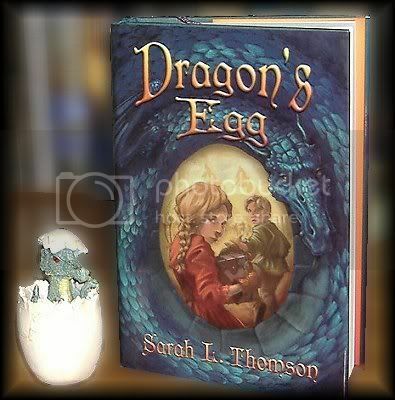 When Mella found the dragon's egg (and at first she didn't know what it was) and then discovered a rather large fierce dragon that had been sent to bring it back to the hatching grounds, she had no idea what she was in for! Written as a very good adventure.. not too much, not too little.. but just about right for the age of the kids and what they might or might not be able to handle, this story was a good one. Very enjoyable. I would like to see a sequel to this story and these characters, although there is no indication that there will be one. This would be an excellent choice of a book to read to younger kids. 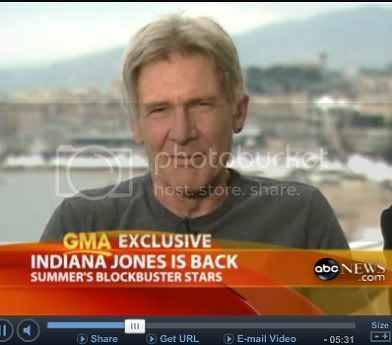 Harrison Ford is making the rounds on television for the opening of the new Indy movie.. It always amazes me that more than a year after they actually make the movie, and have long since moved on and possibly even made other movies, that they are now expected to remember things about something they did so long ago, and act like it was “just the other day”. I realize most actors have excellent memories.. I mean lets face it they are continually memorizing lines and actions for the movie. But after you’ve read more scripts that are offers for other movies that they must get, and possibly have made yet another movie, (memorizing all the things they need to for that movie) then they are expected to forget that newest one and remember the old one. The funny part is that sometimes an interviewer is actually surprised that they might not remember everything... hello? And what were YOU doing a year ago?? Heh. 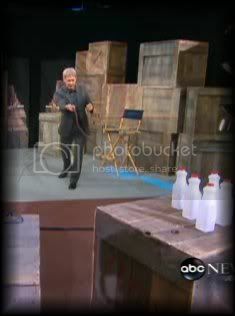 On GMA this morning Harrison used the whip… He talked a little about being out of practice and how the “whip master” taught him to use it.. 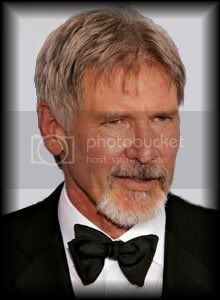 I think what I love most about Harrison, is that he never seems to be egotistical! Well, that and the fact that he’s still gorgeous, *grin. With just a little bit of luck… ok.. more than a little bit of luck.. I MIGHT be able to go see the movie today (Friday). If that doesn’t pan out it will be a week from Saturday before I can go…but you can bet that I don’t want to miss this movie!! I Love the reluctant hero.. 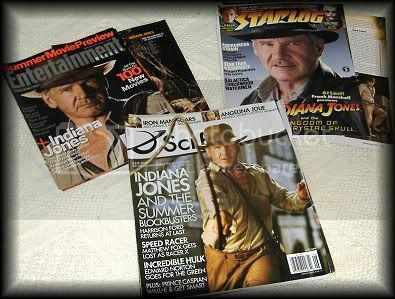 I love Indy.. and I love Harrison for doing them so well…and I believe my “actor crush” is deserved because I truly believe Harrison is one of the good guys. 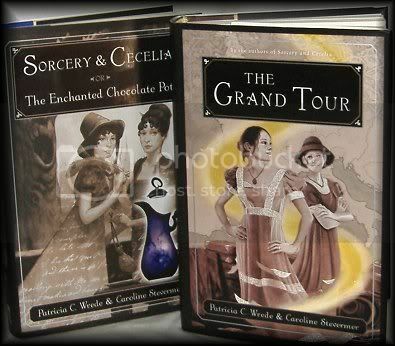 Set in an alternate England in which wizardry exists, this sequel to Sorcery and Cecelia(2003) and The Grand Tour (2004) takes place in 1828. After placing their children in the care of cousin Kate, Cecy and her husband investigate the disappearance of a railway surveyor-magician and the strange properties of ley lines--powerful, invisible channels of magical energy. The story unfolds through the characters' letters, in which the formal locution of the period is leavened by the wit and chattiness of good friends sharing revelations and confidences. This third installment takes place 10 years (and a number of children) after The Grand Tour. The first book was in the form of letters between the two female cousins Cecy and Kate. The second book took the form of writings into their journals. This third book goes back to what started it all.. letters between Cecy and Kate. 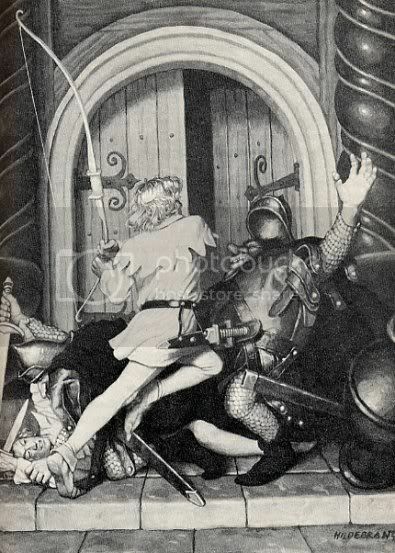 This time though we also get to read some correspondence between the magician husbands, Thomas and James. It starts off as a simple "will you watch the kids so I may accompany my husband for a few weeks"... into , yep you guessed it... another mystery for them to figure out. So, wile Cecy and her husband are off trying to figure things out, Kate and her husband are left at home watching all the children. Although it might seem that Kate and Thomas got the short end of the deal, let me tell you that enough things happen to them during this time to keep letters from both sides interesting and compelling to read on and on. It actually gets pretty funny because you go from one mystery to things that are happening with Kate as she watches both her own kids and Cecy's children. Toss in a few letters from the husbands and the sister from hell and you have a good read! In my opinion it's well written. I certainly can imagine myself in England back in the 1800's, and the fact that these two authors have managed to make being a wizard something of a normal state of being is really great. I enjoyed this series mostly because I really think the way it's written is a nice change of pace and very enjoyable.. but I also think it may not be for everyone. It's a bit of a period piece, along with a mystery for each book, and then on top of it all you feel as if you are "listening in on their lives" as it all happens via the letters and journals. Very original and very enjoyable.. 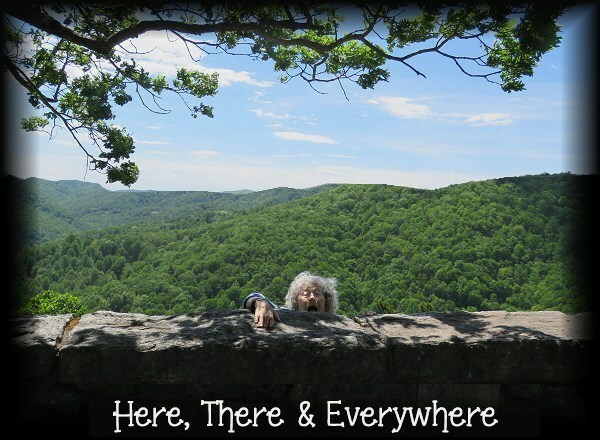 I applaud Patricia C Wrede & Caroline Stevermer for this trilogy of writing. Just as an fyi... book one (Sorcery & Cecelia) can be read as a stand alone book. 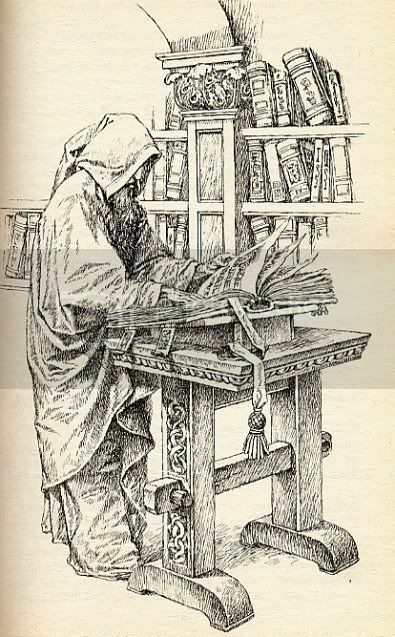 When I look at this list (so far), I see old friends (Pern, Belgarath, Raistlin etc), and I see new friends, (Bartamaeus, Mary Russell, Cecelia etc) and I see time enjoyed inside my books. Knowing this I still wonder, how come it's enjoyable just to look at your books even when you aren't reading them? The people and places in those books, and of course the mystical creatures, are not real.... yet they continue to make me smile, and continue to make me wish I could run away to those special places, with those special people and live some of the lives that are only real in authors heads. Creepy huh? 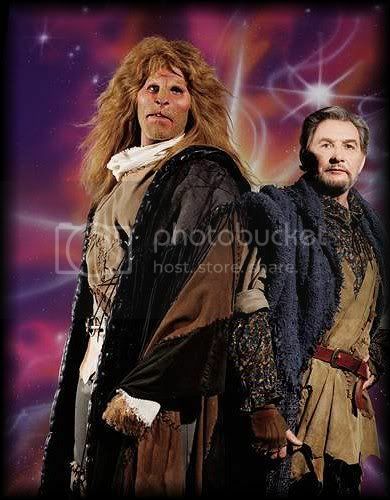 You must be sick of me mentioning Roy Dotrice or anything about Father on Beauty & the Beast. Well............. one more time! 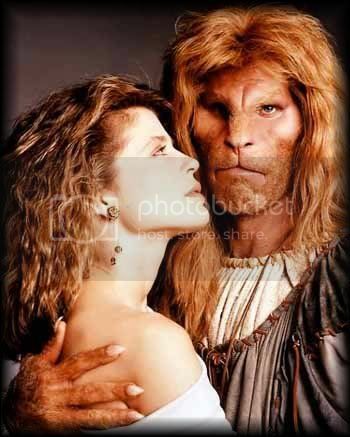 But this time it has to do with the fact that I just purchased all 3 seasons of Beauty and the Beast on DVD!! ohhhhhhhh yeah! Lookey Lookey!! They came in the mail Saturday, and I watched the first dvd which had 4 episodes on it. B&B ran from 1987-1990. As much as I remember each episode (and amazingly I do remember !! I say amazing because it was never in rerun!) as I watch them... I find that I still forgot ..just how good they were! Exquisite costumes!!! I think the next time I see Armin I will have to discuss the costumes with him! I could never say enough good things about the people who did the costumes or the set designs and displays, so I will try to say it in just two words. And just so I had a new photo to show ... I had forgotten (CRS) I had one of Jay Acovone who played Linda Hamiltons boss on the show. Strangely, Armin (Pascal) was in 14 episodes. It seems to be a magic number. I am surprised that he worked as a consultant on other episodes. This is what happens when a really good show gets lost and never hit reruns..things you missed the first time around, ... stayed missed. And lastly, I tortured myself (yet again!) searching for an audio cassette of Roy narrating Watership Down. *sigh* ..geez, who would think an audio tape would be so hard to find??? I mean, I'm talking Watership Down for gosh sake, not the over $1,000 price for George RR Martin's book in which Roy does hundreds of voices!... why do I torture myself? ARGH! Have you ever watched a bad movie just because an actor you like happens to be in it? 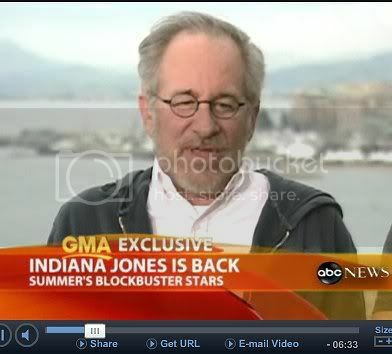 And I did just that this morning on TCM. It was called The People That Time Forgot (1977) ..and it was so "corny" it was almost laughable! But it had one thing.. or rather, one person in it that was always so gorgeous to me that I couldn't not watch it. 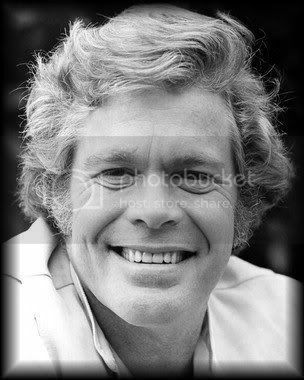 Next is a very young Doug McClure, woof! What a cutie he was! 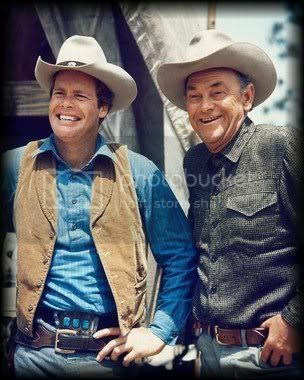 Here's a nice shot of Doug with John McIntire in the television series The Virginian. His character name was Trampas. next is just a gorgeous shot of his irresistible smile! 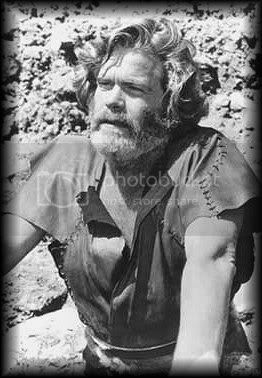 Since I purchased this from a dealer I can not be positive that it's an authentic autograph but I sure hope it is, because I adored Doug McClure and I like thinking this autograph is real. Educated at UCLA, this blond leading man long made a career of apparent agelessness. 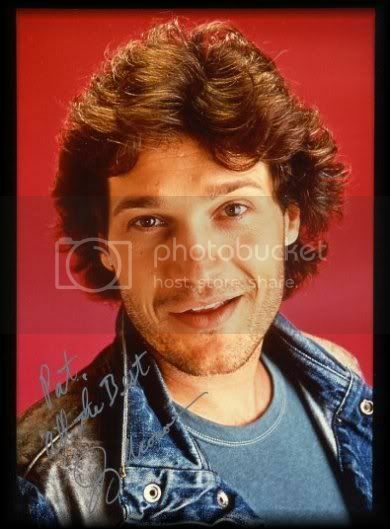 He played one young sidekick after another through numerous movies and one TV series after another, playing 20ish roles into his late 40s. 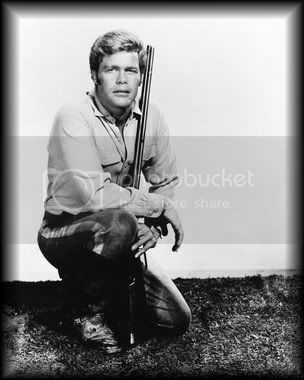 Although he made more than 500 appearances in his career (counting TV episodes separately), he is undoubtedly best remembered as Trampas in the series "The Virginian" (1962) and and Backtrack! (1969). 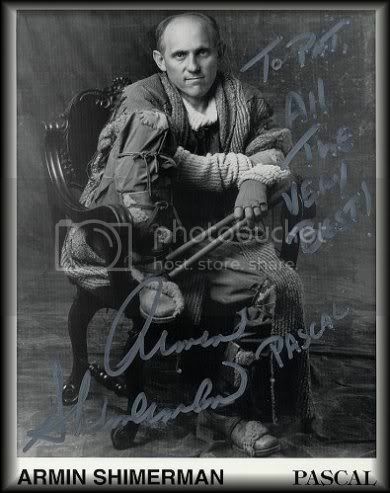 McClure was fighting cancer the last couple of years before his death; despite this, he continued working, appearing in Maverick (1994) as one of the gamblers, as well as in Riders in the Storm (1995) and episodes of "Burke's Law" (1994) and "Kung Fu: The Legend Continues" (1993) which didn't appear until after his death. McClure got a star on Hollywood's Walk of Fame shortly before his death. Even though the movie I was watching with him in it will never make the list of top 10, it was worth suffering through it.. just to see Doug! In this elegant, old-fashioned rambler, a sequel to the historical fantasy Sorcery and Cecilia, a party of five Brits (three of them are wizards)--Kate and Thomas Schofield, Cecy and James Tarleton, and Lady Sylvia--takes a "grand tour" of 19th-century Europe. What promises to be a pleasant exploration of old world antiquities and fancy shops turns out to be an adventure of a lifetime when Cecy receives a mysterious alabaster flask (a coronation treasure) from an agitated Lady in Blue. Before they know it, they are wrapped up in a magical conspiracy to take over Europe. Written in two voices by two different authors, the novel alternates between Cecy's deposition and excerpts from her dear friend and cousin Kate's diary. Despite the crisp, clever dialogue and wonderful character subtleties in this Jane Austen-style comedy of manners, readers may be confused by the episodic nature of the novel whose mysteries take their sweet time in unfolding. 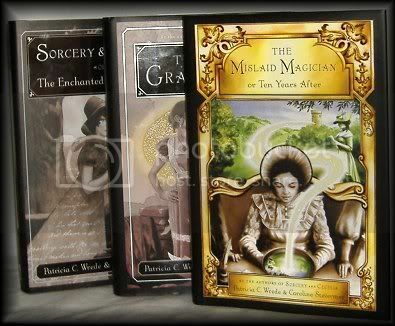 This is book 2 of a series of books by Patricia C Wrede & Caroline Stevermer, the first being Sorcery & Cecelia or The Enchanted Chocolate Pot. Once again Amazon did a good job at reviewing this book. It is only a short period of time from Sorcery & Cecelia to The Grand Tour. In this book both girls married the magicians that they were involved with. They had a double wedding and are going on the Honeymoon Grand Tour together, along with Lady Sylvia (also a magician). In Society back in the 1800's when these books take place, it is proper for a Grand Tour of Europe to get to know who's who and to be seen in all your splendor. The book is a mixture of the grand tour of that time, and a mystery that begins to unfold along the way. In the tradition of movies I've seen such as Sense and Sensibility, things do not move quickly, and are done most proper for the coming out of such ladies. I found I enjoyed the book quite well, but not quite as much as the first book. It was nice now that the two married couples were involved in things and the fact that you were reading whan each girl wrote down in their private journal, made you, once again, feel like you were snooping! I think I most enjoyed the way the authors have set these books up... first you read the letters the cousins wrote to each other in Sorcery & Cecelia, and now you are reading the entries of their journals. This give you two different views as you go along and keeps you on your toes. I'm not sure these books are for everyone. They might be more of a women's book, but I've found them a nice change of pace (in time and place) and just plain enjoyable. One week and counting! 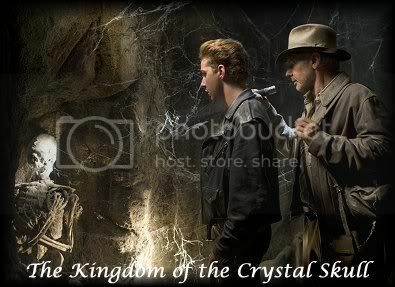 Indiana Jones and the Crystal Skull!! Oh man! 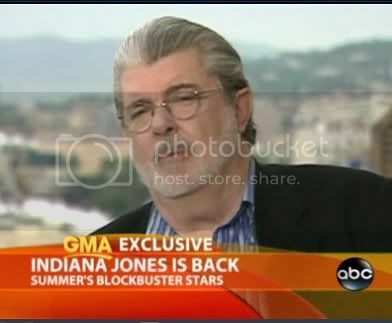 This morning Good Morning America interviewed Spielberg/ Harrison and Lucas.. you can see interview from Good Morning America by clicking the link ! Meanwhile.. here's a few screen caps I did while I watched the interview for the 4th or 5th time.. but who's counting?! heh. Indy, Indy, Indy!! It just can't get any better! Thank you Harrison, Steven and George!! I'm not sure I can do 5 more books for a fourth time.. but while the challenge goes on I'll keep posting my reads until it's officially over! Twelve-year-old Claire and other Blue Wing townsfolk know there's something magical about living along the Mississippi River. How else can they explain Claire's bullying cousin Duke suddenly finding a rhino horn growing where his nose was? Or Duke's parents mysteriously turning to stone? Seeking antidotes, Claire, who "can't resist an adventure," joins Duke and a motley trio of river trolls on a quest filled with obstacles, magic, and mayhem that ultimately leads to a showdown with a Rock Troll, who may hold the key to it all. Folksy charm, inventive fantasy, and diverse characters blend in this offbeat river tallish tale. I have to admit that the artwork on the cover AND the title caught my attention some time ago and is probably what made me buy the book! 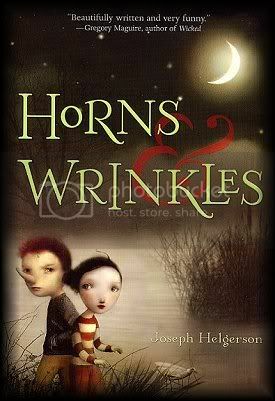 I was really curious of the title.. one could "see" the "horn" part of the title but "wrinkles??" Well I sure don't want to give away the meaning of the title. I will say you do find out before it's all over! heh. Duke and Claire are cousins who hang out together, but it turns out that Duke is quite a bully, even to his own cousin. Each time Duke is mean and bullies Claire his nose grows (flashes of Pinocchio flash thru my mind). I'm sure everyone knew a bully when they were young. Hopefully you didn't have to deal with the bully,but if you did, you could only wish his nose would grow! Claire becomes the one to deal with river trolls and rock trolls and even a blue wing in order to try to save Duke and family members that the trolls have turned into stone. 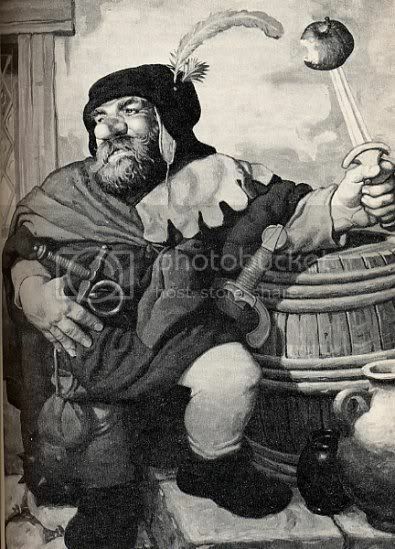 Have you ever had to deal with trolls? Ah, well.. me either, but yaknow.. we all do what we must to get thru life. This was a cute fantasy story, and along with the artistic illustrations by Nicoletta Ceccoli the adventure that Claire and Duke live through comes to life. A very enjoyable book indeed.